If you have been told that you might need a dental crown, it is a good idea to get a better understanding of exactly what they are and what they entail. This overview of this form of restorative dentistry should provide you with the information you need, but you will likely still have some questions for your Woodridge dentists. That’s natural, and you will want to work with a dentist who is able to answer all of your questions satisfactorily. The crown is a type of restoration, and it acts as a cover for the tooth. This covering restores the function and the look of the tooth. These are commonly used when there is an issue with the tooth that can’t be solved with fillings. For example, the tooth could be broken or severely cracked. The crown can help to protect the tooth. The dentist will reduce the tooth so the crown is able to fit over it properly. They will make an impression of your teeth, and then they will send that out to the lab to be made. Until the permanent crown arrives, you will be fitted with a temporary dental crown. Does It Look Out of Place? The dentists work hard to make sure that the dental crown looks as natural as possible. They make sure the size, the bite, the length, shape, and color all match. There is actually no difference between the two. The terms are used interchangeably. 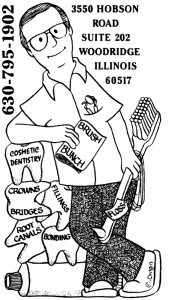 Now that you have a better understanding of dental crowns, you will want to contact your dentist in Woodridge to see if you are a good candidate. You can get in touch with us by calling at 630-795-1902 or by visiting our contact page on the website.